The V7 24" Class (23.6" viewable) LED monitor, L23600WHS, is designed with style, high screen performance and features for home, work and everything in between. The V7 LED widescreen monitor utilizes a low-power LED backlight contributing to a reduced environmental footprint while displaying sharp, dazzling images in Full HD 1920x1080p resolution. With the HDMI input, you can connect to your PC, game console, or DVD player, providing the perfect multipurpose display. The high performance specifications includes 30,000,000:1 contrast ratio, 200 nits brightness, and 5ms response time. 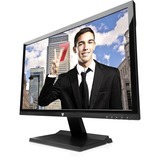 This large widescreen screen LED monitor is a great value and looks sharp on every desktop. With both VGA and HDMI inputs you are sure to enjoy the highest resolution possible. The V7 LED monitor comes fully equipped with two built-in on-board speakers for the complete audio- video experience.